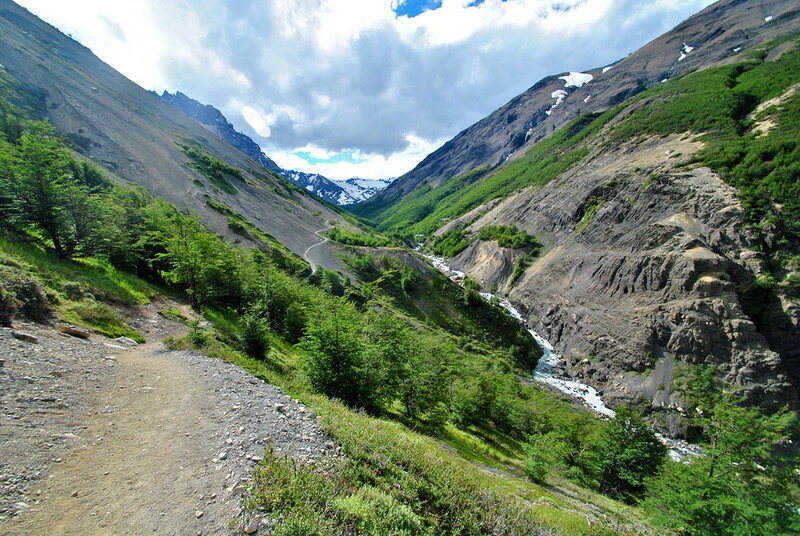 One day trek in Torres del paine national park with photos! After our one day bus tour around Torres Del Paine, we were hungry to get a bit closer to the incredible granite towers of Las Torres, so we signed up for a full day trek to the base look out point just below the towers! The morning of the climb, we packed our usual supply of sandwiches, chocolate, sunscreen, clothing layers and camera, and set off early on the 2 hour drive to the park with our expert guide. After navigating around herds of cows, sheep and guanacos (Chilean lamas) we safely arrived at the Torres Del Paine national park ready for the trek. Keen to set some expectations, our guide informed us that the trek was a 18km return journey, which was a similar length to our experience of the Tongariro crossing in New Zealand, but much shorter than our multi day Sapa trekking hike in Vietnam and our Rinjani trekking adventure in Indonesia. The hardest section was to be the last 45 minutes, consisting of an almost vertical climb over very rock terrain to reach our summit! Great, something to look forward to! So with walking poles in hand, we set off on our adventure to the massives! Much of the first section was an uphill climb, broken up nicely by the odd bridge over the valley’s streams and rivers. Around us we could see the many waterfalls gushing down the sides of the huge mountains that surrounded us. 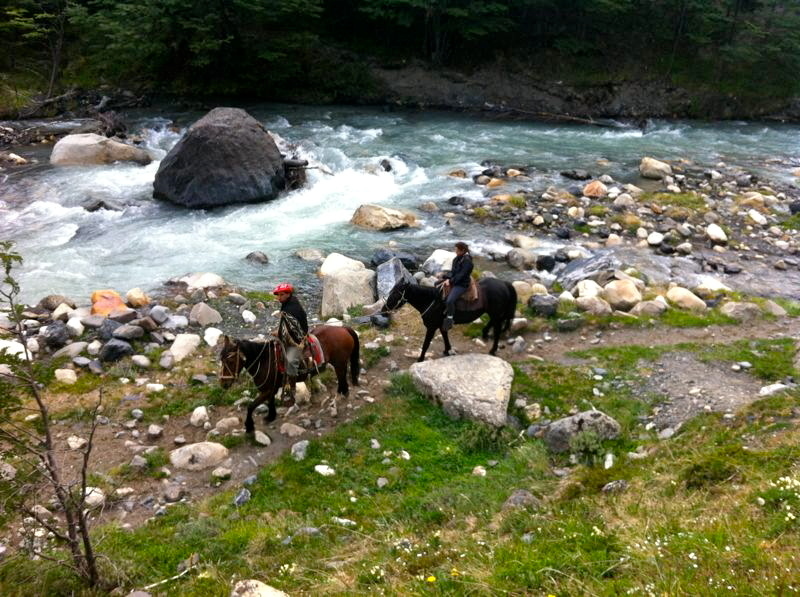 Every so often we’d be unexpectedly interrupted by traffic passing through; horses from the local estancia carting supplies up the valley to the refugio half way along the track, the only form of transport along the route. After a couple of hours trekking and working up a sweat, we were relieved to reach our first break at a nice spot next to the river. Suitably refreshed with water and chocolate (well we were burning calories!) we set off once again, this time through the deep forestry section of the trek. Despite the rain kicking in at this point and layering on the waterproofs and hats, we all enjoyed the change in terrain, and managed to increase our pace through this slighter flatter section of the trek. We found ourselves with renewed energy surrounded by lush green forest, beautiful twisting trees, rustic rickety bridge passes and the odd glimpse of stunning waterfalls on the distant mountains. Then, after around 3 km of jungle trekking, we spotted the opening in the distance that would reveal our final destination. Excited, we practically ran towards the opening in the trees and glanced left to see the towers looming eerily amongst the dark clouds above us. After admiring the towers for a while and photographing the moment, I noticed the final piece of terrain we were about to encounter. Warned about the hard final section at the start by our guide, I should have expected it, but the steep incline and huge boulders loomed ahead of us worried me a little. Only 45 minutes, I whispered to myself – you can do it. Flanked by our quietly supportive guide and with my friends pushing on ahead, I applied my usual tough trekking technique of getting the head down, counting and powering on. After climbing approximately 400 metres of rock and what felt like more than 45 minutes of pain, we finally reached the top of the boulders. We had just one final push to clamber around the side of the mountain, up and over some even larger rocks and boulders to reach the base look out. Ten minutes later we reached our final destination and we were delighted to be greeted by this sign! With a couple of large groups there already, we decided to go a little further to find our own private spot where we could rest and enjoy the towers by ourselves in all their splendour! Just by luck, the rain had stopped before we arrived and the dark clouds we’d seen from the bottom were starting to lift, to reveal many more metres of the three towers. We congratulated each other and found a nice spot to sit and admire the view of the towers and the beautiful turquoise lake lying still beneath them. After re-energising ourselves with our packed lunches and more chocolate (I was burning lots of calories honest), the cold wind at the high altitude started to bite, so we quickly layered up and began our long descent. Helped by our trekking poles, we managed to descend pretty quickly and powered back through the forest towards our half way point where we had a welcome break before our final push back to our starting point that morning. All in all it took us around 4 hours to reach the Torres base summit and 3 hours to return. Exhausted but very satisfied by a fantastic day’s trekking, we hopped into our mini-bus and embarked on our journey back to Puerto Natales where Barry was waiting with pizza and beers to celebrate our trek – result! We would rest up for a couple of days before our journey to the end of the world! What Do You Think? 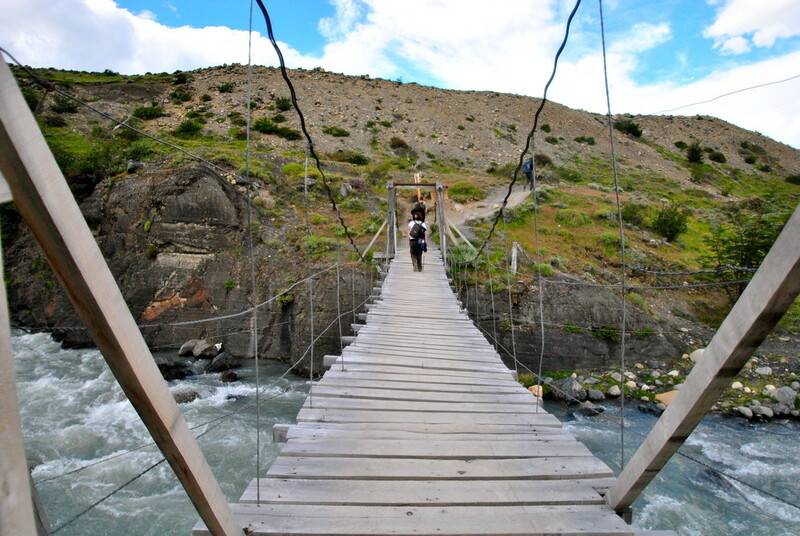 Have you trekked Torres Del Paine? We’d love to hear your comments and experiences in the comments below! I absolutely loved this post. We are planning a 2 week trip to Chile next March and I’ve been looking for day hikes and treks to do as we probably aren’t fit enough to do the full W circuit.thanks for sharing your journey. Would you say it is necessary to book a guide in advance or is it quite easy to find one once we arrive in Porto Natales? thanks! We booked our guide through our accommodation when we arrived and it didn’t seem to be much of a problem to get arranged, but we were there for a week so we had enough buffer if we had to wait a couple of days. We always suggest you make contact with your accommodation in advance to check what availability is like (and if they can arrange it all). Just to be on the safe side! I am heading to paragonia next week, I would be really interested in doing this day trek how much was it? Hi Avril! We actually did this trek a couple of years ago now, so we’d reccomend checking out some tour companies on tripadvisor and contact them directly for up to date costs! Enjoy the trek, we’re very jealous! This looks like an awesome experience. I hope you will get more enjoy. After reading it we will also planning for a trip.Thanks for sharing this wonderful blog. Hy, nice post. I will also use one day in Torres del Paine so can you give the name/contact/web of your accommodation/guide? Do you think that it’s hard to visit all that without guide? Hi Boris, we just booked through our accommodation and it seems most places offer a one day tour! Best to contact your accommodation directly! Hey nice post and your blog is looking great with these photos. Chile’s is one of the most beautiful destination in the world. I hope you enjoyed your trip at Torres del paine national park. Thanks for sharing with us. Keep up blogging. Where did you stay in Torre del Paine? Did you book your 1 Day Trek through your accommodation? Could you tell me where that was? Thank you! 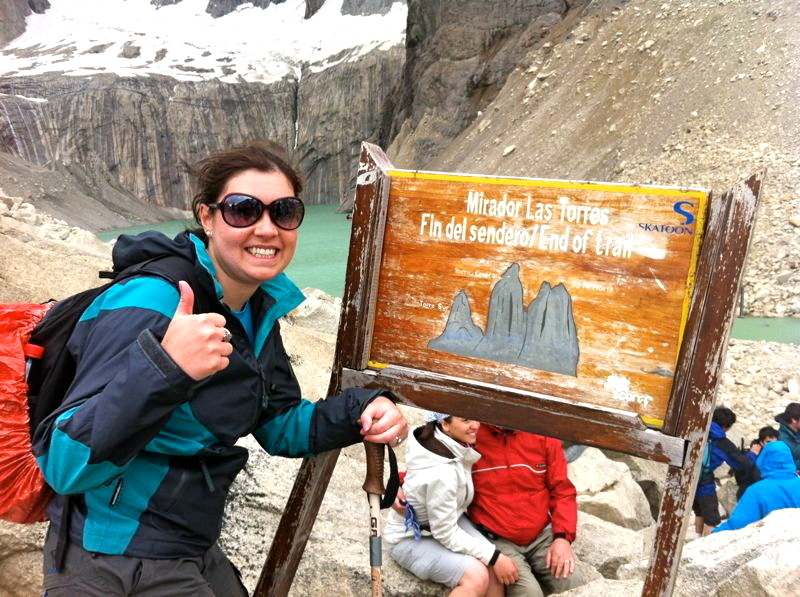 Hi Elise, we stayed in a small B&B in Puerto Natales, and arranged all of our TDP day trips/treks from there. It was quite easy to do. Unfortunately we don’t have a note of the place we stayed as it was quite last minute and a little random to be honest. We didn’t book our accommodation for there far in advance, but I’d definitely recommend that you do as it gets booked up quite quickly, especially in peak trekking season. I recommend checking trusty Tripadvisor, Agoda.com and Booking.com for accommodation recommendations and these are good sources for Chile. As far as the tours, we just booked them through a local agency in Puerto Natales, however if you’re keen to arrange something in advance then again Tripadvisor is probably best for up to date pricing & agency reviews. Sorry we can’t be of more help on this particular one, it was a while ago now! Hope you have a great trip!